Let me begin with a piece of advice. If someone wants to ask you a question and they begin with something like, “We know you are wise and you never tell a lie and you don’t care how popular you are or whom you offend,” run the other way. It is clearly a set-up. This pericope is the Covenant Code between God and God’s people. Certain classes are singled out: strangers, widows, orphans, the poor. God always sides with the marginalized. God reminds them that they were once strangers too. It’s like that saying not to know what someone is going through unless you walk a mile in their shoes. Compassion – which means, literally, “to suffer with” – is the way to the truth that we are most ourselves, not when we differ from others, but when we are the same. It is not proving ourselves to be better than others but confessing to be just like others that is the way to healing and reconciliation (p. 135). The compassionate life is the life of downward mobility! In a society in which upward mobility is the norm, downward mobility is not only discouraged but even considered unwise, unhealthy, or downright stupid…It is the way toward the poor, the suffering, the marginal, the prisoners, the refugees, the lonely, the hungry, the dying, the tortured, the homeless – toward all who ask for compassion. What do they have to offer? Not success, popularity, or power, but the joy and peace of the children of God (pgs. 138-139). Paul seems very pleased with this early church. They must have been living Jesus’ words sincerely in their lives. He seems to emphasize the effect of modeling that sincerity, without the need to even say anything. How powerful affirmation is and being reminded that there is good in us! Paul speaks of the “joy from the Holy Spirit” in the Thessalonians for reaching out to others. Henri Nouwen says, “Joy is the secret gift of compassion…Joy does not simply happen to us. We have to choose joy and keep choosing it every day…,” (p. 142, 31). In verses 9 and 10 two words are used which are characteristic of the Christian life. The Thessalonians SERVED God and WAITED on the coming of Christ. The Christian is called upon to serve in the world and to wait for glory (Barclay’s Daily Study Bible Series, p. 187). On the face of it, the question appears very honest. The Pharisees identified 613 commandments in the Torah. How could anyone remember all of them? Were some more important than others? (Pilch’s Cultural World of Jesus, p. 154) But the Pharisees are continuing (from last week’s reading) in their quest to target Jesus. He turns to scripture for his answer, citing Deuteronomy (6:5) and Leviticus (19:18). 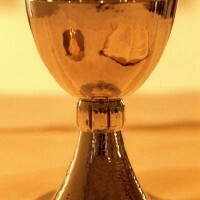 Have you ever noticed the chalice that is used in Mass causes a reflection? Some of the cups are colored or muted, but the gold cups in particular act as a mirror. When Father Bob holds it up during the consecration, I can see the congregation in the cup. When it is on the table, I can see the book of prayers and other vessels for Mass. And when I go up for communion and receive the cup, I see myself. It reminds me of other mirrors. The mirror on my van reflects things as bigger than they actually are. The mirror in my hallway tells me whether I’m going to stick with the first outfit I put on or a later rendition. The mirror in the parish office is one way, so inside I can see people coming in but they can’t see me. Most of these mirrors have a purpose of showing me something I need to know. They reflect information. But the chalice is different. It reflects who we are to become, and that is Jesus. Everything that cup holds and brings forth is Jesus. As Catholics, we believe we receive Jesus in the bread and wine. Jesus wants us to look at his whole life, death and resurrection; and then, we should take that leap and say yes to all of it. We drink it in. We say yes to our belief in it and say yes to our living it. So seeing what the chalice reflects is powerful. We aren’t just seeing ourselves but Christ who is in us. It is a glimpse of how God sees us, really. We drink the wine and we are given a message. God is saying, “Look! Look what love does! Now go do it!” Father Bob raises the chalice that is Jesus within and, as a community, we have the capacity to mirror Him. Eucharist is more than bread and wine. It is an action. We are Eucharist-ing. We are like the cup itself, holding Christ and reflecting Christ. We share in this mission together at Mass. We are communing. And then we are sent forth (The word Mass comes from the Latin missa, or to go, sent forth.). As we attempt to come and follow Jesus, be strengthened by what Jesus gave us. Jesus gave His very self, and wants us to be His living mirrors. How might you reflect Jesus this week? In verse 4 Paul speaks of the Thessalonians as brothers beloved by God. This is a phrase applied by the Jews only to supremely great men like Moses and Solomon, and to the nation of Israel itself. Now the greatest privilege of the greatest men of God’s chosen people has been extended to the humblest of the Gentiles (Barclay’s Daily Study Bible Series, p. 187). How does being loved by God make a difference in your life? Again we hear the words that Israel is God’s chosen one, but that God wants all people to know God. We are God’s chosen. Henri Nouwen says, “It certainly is not easy to hear that voice in a world filled with voices that shout: ‘You are no good, you are ugly; you are worthless; you are despicable, you are nobody – unless you can demonstrate the opposite.’ These negative voices are so loud and so persistent that it is easy to believe them. That’s the great trap,” (Life of the Beloved, p. 31). What other words do you associate with CHOSEN? Who are the Herodians? It is much disputed among theologians as to whether they were a religious sect who thought Herod was the Messiah, or perhaps anti-Roman Jews. It is most probable that they were those who favored the house of Herod, supporting Herodian rule and the Roman rule upon which it rested. In other words, they think like Herod (Dictionary of the Bible, p. 357). How did Herod think? Well, he was famously paranoid to the point that he coined the phrase, “Better to be a pig than a son in the house of Herod.” Herod did not eat pork but he did kill three of his children when he suspected them of wanting to usurp his throne,” (Powell’s Introducing the New Testament, p. 27). In other words, he was blinded by power. St Thomas More (later beheaded by King Henry VIII of England) said that when a person separates their conscience from their public duty, they rush the nation toward chaos. What do you think? “It is not always easy to know how to apply one’s convictions to particular issues. But we are never excused from doing so. For conscience remains the litmus test of all our behavior. All of us live in the human city, but we are always mindful of our primary citizenship in the city of God,” (Faley, Footprints on the Mountain, p. 671). “For there was nothing I could reply when you called me: Rise, thou that sleepest and arise from the dead: and Christ shall enlighten thee; and whereas You showed me by every evidence that Your words were true, there was simply nothing I could answer save only laggard lazy words: ‘Soon,’ ‘Quite soon,’ ‘Give me just a little while.”…”How long, how long shall I go on saying tomorrow and again tomorrow? Why not now, why not have an end to my uncleanness this very hour?”…(and after reading scripture and experiencing conversion)…”You, Lord, alone have made me dwell in hope,” (Confessions, p. 165, 178, 191). This story can provoke questions in us: Do I get distracted by things in life so as not to follow where God is leading me? Do I (or someone I know) create drama in life rather than live in an honest way? Where do I put my energy? To what extent do I let my conscience help me make my decisions? How do I live a CHOSEN life? This passage is known as the “Isaiah Apocalypse”. Isaiah looks ahead to the last age and the end of all time. This piece, written after the exile, describes the reconstruction that will take place after the destruction of the earth and all its people. This destruction is a result of the sin of the people. But all is not lost. God can turn the tables, change his course, and refrain from striking the mighty blow. The feast is a sign that he will do it. He will restore the city on the mountain (Jerusalem). He will restore ALL people. This passage is particularly noteworthy as it is the earliest expression in the scriptures that God intends to conquer death. The banquet is a sign that joy (the wine) will reign triumphant over anguish (the veil over the people). The early church believed the eucharist to be the eschatological banquet here on earth while they were awaiting the glorious banquet in heaven (Birmingham, W&W, p. 538). Consider who is present, seen and unseen, at this banquet with you at the Lord’s Table. This is often a reading at funerals. Isaiah’s security lies in the covenant with God, not in covenants with Egypt or other nations. The mysterious power of faith maintains: God alone is true protection. Such power will not collapse in the hour of disaster…never must a calamity shake Israel’s trust (The Prophets, A. Heschel, p. 73). Do you hear it? Think about the state of our country and the world today…does this give you comfort? We have all had times when we lived paycheck-to-paycheck and other times when we could afford the big vacation. Throughout all of these times, where was God for you? There is a freedom in Paul’s words. St. Ignatius says, “We should use God’s gifts of creation however they help us in achieving the end for which we were created, and we ought to rid ourselves of whatever gets in the way of our purpose. In order to do this we must make ourselves indifferent to all creation, to the extent that we do not desire health more than sickness, riches more than poverty, honor more than dishonor, a long life more than a short life, or anything at all in and of itself. We should desire and choose only what helps us attain the end for which we were created,”(Retreat in the Real World, p26). Isaiah’s feast is on top of the mountain; the Psalm places it in a pasture (23); the Gospel banquet is a wedding feast and celebration. Compare to Luke 14:16-24 which scholars say may be the older version. It leaves out the verse on burning the city. William Barclay says these verses form not one parable, but two, and they should be read separately to gain the most insight (Verses 1-10 and 11-14). He says we should be impressed in these stories with the unwillingness of the guests to come and to celebrate together AND the repeated patience and invitations of the king. God’s invitation is an invitation to joy, to love, to new life — a wedding! The things that get in our way of responding to God’s invitation are usually not bad things in themselves. The excuses that were offered were about daily life and normal business affairs. Yet this parable can be a warning: WE CAN BE SO BUSY MAKING A LIVINGTHAT WE FAIL TO MAKE A LIFE! God’s love and life extended to us (GRACE) is a free gift – a surprisingly wonderful gift. We need to be open to God’s surprises and, like all gifts, it must be opened and used – God wants our response and our participation. Eduard Schweizer ( The Good News According to Matthew, 420-422) says that the last line about the called and the chosen concerns how we respond to God’s invitation: to be ‘called’ means that we take up the initial invitation – to be ‘chosen’ means to preserve in that call to the end. What is meant therefore is that we who are called by God must not look on this call as something that is ours by right; we must live it anew each day (choose) trying always to put on the Lord Jesus. These scriptures challenge us to face the fact that we often like to insulate ourselves and isolate ourselves from others. We choose not to become involved. Yet, our God is a God of relationship. God refuses to be left alone! The royal wedding feast is a symbol of God’s love and union with his creation, and it is open to everyone. Parties are an apt image for Christian involvement. They force us to think of relationships. They move us to create an atmosphere of festivity. They remind us of the centrality of community. But whom shall we invite to our parties? We generally think of all those ‘nice’ people who will return the favor by inviting us to their homes. Today’s liturgy suggests that we expand our vision and look especially to those who are hurting. Will we attempt to wipe away tears, as Yahweh does in the first reading? Will we try to offer protection to the harassed, as Yahweh does in the responsorial psalm? Will we seek to provide hope for outsiders, as the king does in the gospel? We know people who belong in these categories. The challenge is to act upon this awareness and send out the invitations. Isaiah realized that God cares for us His people like a precious vine: He cultivates us, cares for us, prunes us, nurtures us, waters us and removes the stones from our hearts. He expects us to grow, to bloom, to produce a good harvest. Those darn Israelites never seem to get it right. Can you relate? Do you ever feel like you try so hard and yet can’t seem to get it together? Sometimes children work hard on an assignment and end up crumpling it up because of their frustration. We hear the frustration in God’s voice through Isaiah. This harsh love language can be difficult because of the strong emotion. But in the end, God stays with the Israelites through their trials. Some thoughts from Harold Kushner in How Good Do We Have to Be? : “…if we cannot love imperfect people, if we cannot forgive them for their exasperating faults, we will condemn ourselves to a life of loneliness, because imperfect people are the only kind we will ever find,” (p. 111). “Being human can never mean being perfect, but it should always mean struggling to be as good as we can and never letting our failures be a reason for giving up the struggle,” (p. 174). Paul encouraged his Philippian brothers and sisters and urged tenacity in prayer. Worry drains us of energy and hope. Not that he was suggesting a Pollyannaish approach to life either. Paul knew how hard life was. There was a large military presence in the area, and the Gentile Christians also had a difficult time dealing with the Jewish Christians. “What is the right thing to do?” was a constant question. So Paul says pray, and peace will be given. Do you experience this in your prayer life? Even if there is no answer, prayer reminds us of God’s constant presence, and there is solace in that. Paul also says hold fast to Jesus’ teachings. Hold on to what is true. There is peace in that too. Do you experience this? The tenant farmers are frustrated, desperate and driven to violence. They beat and kill the first 2 delegations from the owner. When the owner’s son shows up, they miscalculate and presume that the owner is dead. Believing the son to be the sole surviving heir, they kill him in hope of gaining the vineyard for themselves. The plan is stupid and illegal, but they are driven by their otherwise hopeless situation (Have you even done something “stupid” because of desperation?). The owner is very much alive. The owner must act. Compare this vineyard story to the one in Isaiah. There are no tenant farmers in Isaiah; God destroyed the vineyard itself. In Matthew, the tenant farmers are destroyed and the vineyard given to others. It is a problem of leadership. The tenant farmers (and Jesus may have been calling out the chief priests and Pharisees) must be replaced because they have not born fruit. So leadership will be transferred to others (us?) who will produce proper fruit (p. 145 – 147). This parable ends with an image of a cornerstone. This picture is from Psalm 118:22: “The stone which the builders rejected has become the head of the corner.” Originally the psalmist meant this as a picture of the nation of Israel. But Jesus is the foundation stone on which everything is built, and the corner stone which holds everything together. It may be that people reject Christ, but they will yet find that the Christ whom they rejected is the most important person in the world, (Barclay, The Daily Study Bible Series: Mathew Vol 2, p. 264-5). Jesus is all about seeking relationship and bringing goodness to fruition. At what lengths will you go to seek relationship with Jesus and bring good to fruition?